To fulfill the requirements as a global supplier for superior quality Electroless Nickel Technologies, COVENTYA is investing heavily to support our Global customer base. Today hundreds of our EN customers Worldwide rely on the support and quality of our ENOVA Electroless Nickel Systems. 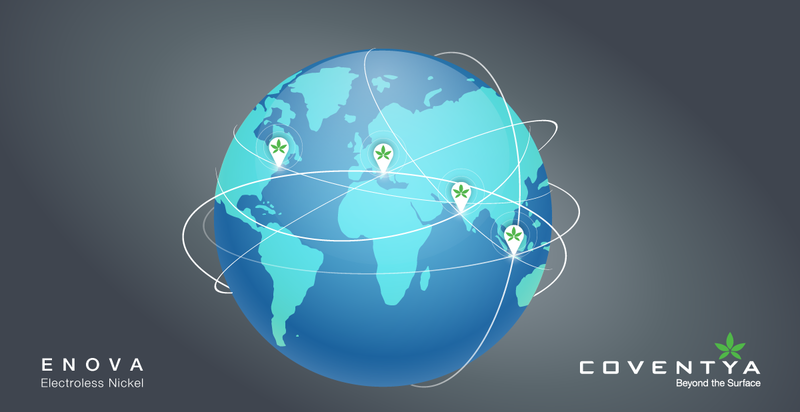 COVENTYA supports these needs with 5 State of the Art Electroless Nickel Manufacturing Sites on 3 continents. The Global Technology Transfer Protocol ensures the same superior quality Products no matter where you buy our ENOVA Electroless Nickel Systems. Our supply chain is supported by 2 Research and Development teams constantly working to provide our customers the best new Technology and application know-how. Taking a Technology Partnership approach with our customers and the market makes sure that products utilized fit critical demands. So why don´t you join us on our worldwide journey and learn more about what ENOVA Technology can provide for your application.